Have you ever wondered why Superman has to keep his hand in front of him when flying? Wouldn't it be easier for him to just align his arms alongside his body and fly like Ironman? 1) He just doesn't know what to do with them and his suit doesn't have any pockets. 3) To swat away the bugs before they hit his face maybe? 4) In my opinion, it's because he doesn't actually fly. He just punches the air so hard that his entire body flies behind his fist for miles. 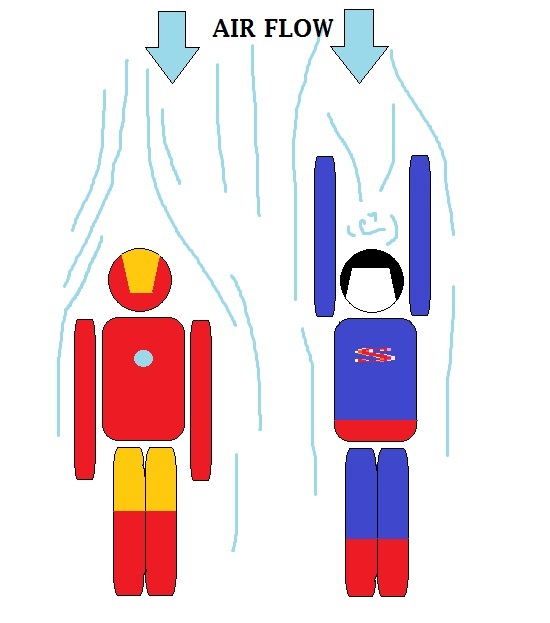 I've drawn a picture comparing the flying posture of Ironman and Superman. It's clear that when you raise your hands like Superman does when flying you'll experience greater air resistance in the gap between your arms and that'll slow you down. But if you keep your arms by your side like Ironman, then your overall body posture presents a more aerodynamic shape. Superman doesn't put his hands together--like swimmers do when launching from their platform--to create a more aerodynamic shape. In fact he doesn't have to worry about air resistance because, well, he's goddamn Superman! So I think the answer to this question is simply because the author thinks it looks cool. But I think it's awful.